These are magic weeks in the groves of the Central Valley citrus belt, a time when orchards are buzzing with honeybees and redolent with the heady, sweet smell of orange blossoms. 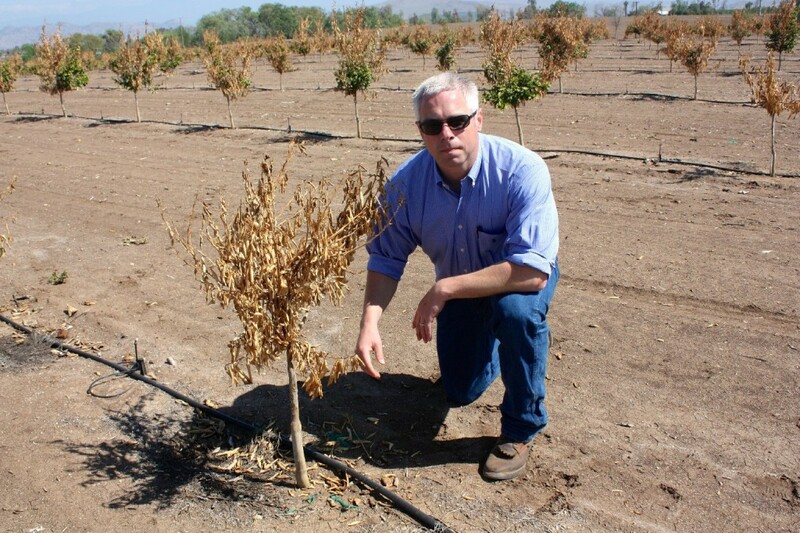 But around the Tulare County town of Terra Bella, farmers like Matt Fisher smell doom. A cold snap last December hit this area hard and dried up lots of Fisher’s fruit. Many of his baby mandarin trees are still brown and fried. The surviving orange trees face a double-whammy: first the freeze, now no irrigation water whatsoever to keep them alive as they move into the spring and summer. Fisher farms in the Terra Bella Irrigation District, which is in an especially tight spot. Farmers in other parts of the San Joaquin Valley may decide not to plant tomatoes or onions this year. But in Terra Bella, the main crops are citrus and pistachio trees. Not watering them could cripple the local farm economy for years to come. Unlike other parts of California’s farm belt, Terra Bella has almost no groundwater. Now Terra Bella’s 600 farmers have gotten some shattering news. For the first time ever, they’re likely to get no water this year from the federally-operated Friant-Kern canal. Farmers in this part of the valley have always enjoyed priority rights to the water that comes from the federal canals. But last month, authorities here sealed the water connections to all farms in the district. Fisher opens up the lid to his water meter to show me a wire wrapped around the spigot, hooked to a green tag that reads, "No irrigation water is available this year. Illegal use of irrigation water is subject to penalties. Your meter has been sealed." 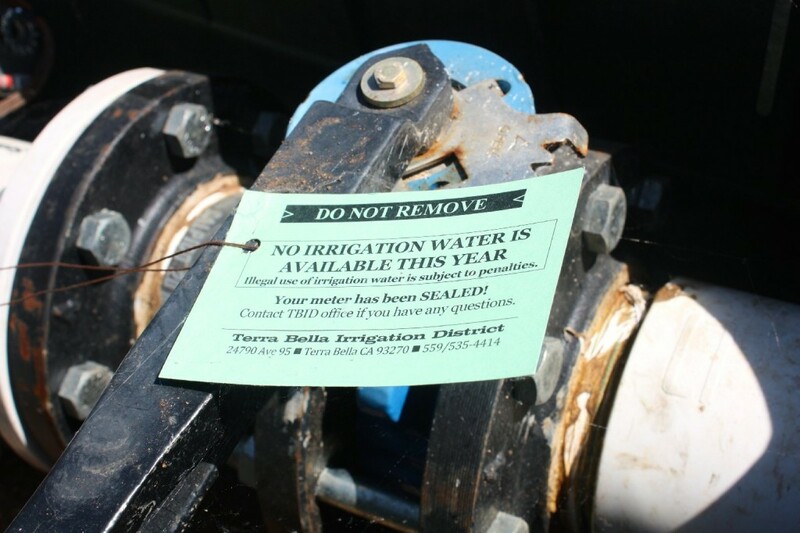 The irrigation district is levying some hefty fines, including a $10,000 penalty for cutting the seal. But with Terra Bella’s $100 million citrus crop at stake, irrigation district manager Sean Geivet knows a $10,000 fine may not be enough of a deterrent to keep farmers from breaking the seals. Geivet’s also looking like a banker. Desperate farmers have dropped off $4 million in checks at Geivet’s office. He’s just holding them in his safe until he can find some water to buy on their behalf. With a projected allocation of “zero” water from the federal Central Valley Project, Geivet spends nearly all his time on the phone, trying to drum up other sources of water. That zero adds up to trouble for the town of Terra Bella, where about 6,000 people rely heavily on the citrus industry – and the same irrigation canal that feeds area farms. The federal government does plan to continue supplying drinking water for residential customers here who rely on the Friant-Kern canal, but only half the usual amount. At the irrigation district office, Patty Gutierrez tries to explain the importance of conservation to residential customers like farmworker Miguel Cortes, who comes to pay his bill in his cowboy hat. “You have to conserve water,” Gutierrez reminds him in Spanish. “You can’t use more than 32,670 cubic feet per year.” (That’s about three-quarters of what a typical American household uses.) Customers who go beyond that in Terra Bella may face a $3,000 fine. At this point, Cortes is more worried about losing his livelihood than whether or not there’s enough water to wash his car. “We depend on the work in the fields,” he says in Spanish. “We don’t know what’s going to happen with our jobs if there’s no water. What can we do? All we can do is wait for what’s coming next,” he says. Just down the road, Terra Bella resident Jose Melendez is carefully watering his plants with a coffee can. “There’s no water coming in. We’re out. I get it,” he says, pointing to the hose he once used to wash off his patio. Like many residents here, Melendez has two meters: one for outdoor irrigation, and one that provides filtered canal water for indoor use. And like Terra Bella famers, his outdoor irrigation meter is sealed. So now he’s having to use the more expensive drinking water for his plants. He’s willing to do that, and to stop watering his lawn. But he wants the irrigation district to do a better job of educating residents on conservation and helping them calculate a running total of how much they are using. There’s nothing on their monthly bill that shows how close they are getting to the limit set by the district. The water district says it is sending out letters to residents about conservation, but its main concern is not household use. It’s agriculture. Farmers use more than 90 percent of the water here.